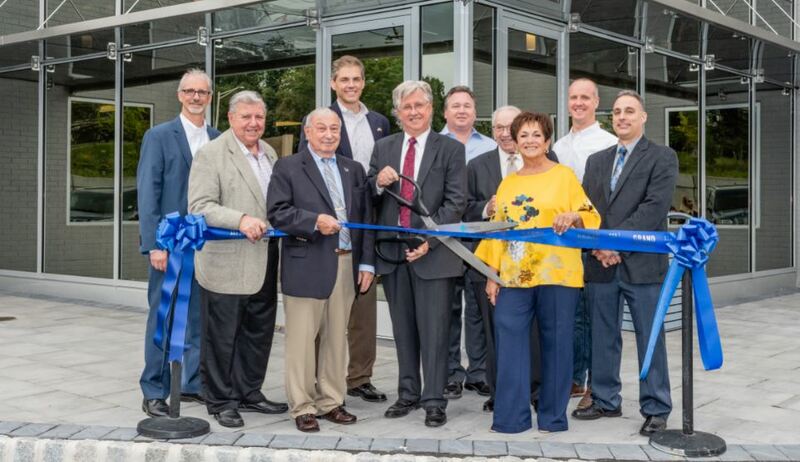 Parsippany, N.J. (September 27, 2018) – Executives from NAI James E. Hanson, a leading New Jersey based full-service independent commercial real estate firm, and Commercial Realty Group (CRG) were joined by State Senator Anthony Bucco, State Assemblyman Jay Webber, and Parsippany Township Council members, Loretta Gragnani and Michael DePierro to celebrate the ribbon cutting for 111 Littleton Road, a renovated 36,289-square-foot three-story office building at the intersection of I-80 and I-287 in Parsippany, N.J. The ribbon cutting for 111 Littleton marks the completion of a renovation project to a property with unparalleled access to Northern New Jersey creating a home for image conscious small businesses. Designed by Paul Newman of Kimmerle Newman Architects and Mario Iannelli of Dewberry Engineers and built by Michael A. Walsh, President of CRG affiliate, Corporate Contracting, Inc., the renovation project at 111 Littleton Road included the addition of a stunning new façade, a new two-story atrium, increased parking, new landscaping, new restrooms, and full common area upgrades. “Small business is the driver of employment and the economy in New Jersey and the US. As a small business we appreciate, every day, the fantastic access this location gives us and the energy that the cool design by Paul Newman provides. This is a rare combination. We think other similarly-minded small businesses will recognize this and join us and Strategic Micro Systems in the building,” said Andrew H. Billing, General Manager for CRG. Featuring unsurpassed access and visibility from Interstates 287 and 80, 111 Littleton Road provides tenants with the unique combination of image, visibility and accessibility not found in other buildings in the surrounding market. This and the building’s smaller floor plates make it ideal small businesses searching for image space. 111 Littleton Road currently has 20,000 +/- square feet available in units from 1,250 square feet to a full floor of 13,000 +/- square feet. Interested tenants should visit https://111littleton.com/ for more information about the property or contact NAI James E. Hanson listing broker W. Joshua Levering, SIOR, at (973)240-2102 or jlevering@naihanson.com.